Dale and Sheree Miles Gubler served in the Utah Provo South Mission where Elder Gubler was the Director of Cove Fort Historical Site, serving from February 8 1999 until February 8, 2001. Dale and Sheree were married May 8, 1953 in the St. George Temple. Sheree Miles grew up in St. George and Dale in Santa Clara. With a great love and desire to raise cattle when he was just a young boy, Dale made beef production his occupation along with real estate development. They have been blessed with seven loving children and 27 beautiful grandchildren. They love and cherish each one of them very much. After serving a mission in the England London South Mission, they were called to Cove Fort, as Directors, where dreams come true. What a blessing it was in their lives to be in their beloved Cove Fort mingling amid the greatest missionaries the Prophet has called. 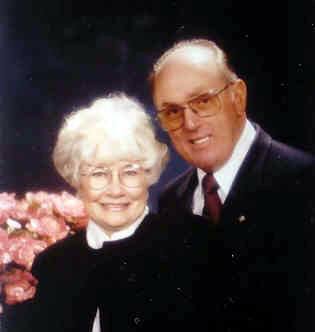 Elder and Sister Gubler served with 23 missionary couples in 1999 and 24 missionary couples in the year of 2001. Also, there were 88 service missionaries serving one or two days a week during these two years. They came from neighboring communities. During the two years the Gublers were at Cove Fort, there were 172,000 visitors, of which many were visitors from many nations of the world. Nearly 21,500 were not members of the Church, and the missionaries received 1737 referrals, contributing greatly to the missionary work and growth of the church. “Our missionaries at Cove Fort came from many states and as far away as Minnesota. “They came with a wonderful missionary spirit and willing to do anything they were called to do, such as helping to maintain the buildings and grounds, which included beautiful and bounteous vegetable gardens and flower gardens. “They took guests on tours and took part in many exciting functions held at the Fort, such as parties, home evenings, talent shows, and visiting entertainment. Many bus loads of tourists stop at the fort to visit as they were on scheduled tours.